Olewo Red Beets can help relieve and prevent skin irritations, itchiness and inflammation in horses with natural detoxification and anti-inflammatory support. Red beets are loaded with powerful nutrients and have a tremendous amount of healing potential. Symptoms of insufficient nutrition often show up first on the skin, the largest organ in the body which is ultra-sensitive to nutritional deficiencies. Red beets help maintain efficient metabolism and healthy weight. They provide slow-release energy which is great for performance and competition horses. A daily dose of Olewo Red Beets added to your horse’s regular feed will help with proper nourishment, ongoing natural detoxification, and inflammatory support to prevent common ailments in the first place. Olewo Daily Red Beets for Horses is a premium product made in Germany from 100% fresh, non-GMO red beetroot, without additives, and preserved naturally through dehydration. If the term “food as medicine” applies to anything, it applies to red beetroot. Red Beets are packed with powerhouse nutrition including a variety of vitamins, minerals and antioxidants rarely found in such high concentrations within one food. 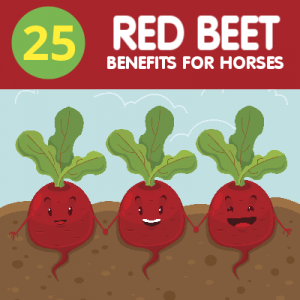 Many horse owners are still unaware of the nutritional power of these bright red beetroot vegetables that have numerous proven benefits for virtually every system of the body. When Olewo Red Beets were first introduced in the United States, most of our customers referred to the product as “beet pulp”, but “ This is NOT beet pulp” – there is a huge difference! Beet Pulp comes from sugar beets and is the by-product of commercial sugar processing. Beet pulp does NOT contain the powerful nutrients found in red beetroot, and ALL sugar beets grown in the United States are now genetically modified! Olewo Red Beets are made from red beets that are grown for human consumption and are valued for their many health-promoting benefits. Red beets contain powerful health-promoting phytochemicals called betalains. One in particular called betanin has outstanding anti-inflammatory, antioxidant, and detoxifying effects. We live in a world with more toxins than any other time in history. Just like humans, horses are exposed to many toxic chemicals every day. Toxins are in the air they breathe, the food they eat, the water they drink; the drugs, vaccines, chemical wormers and flea treatments they receive. Toxins also enter the body through bacteria, fungi, parasites, and infections, and the list goes on. When the horse’s system gets overburdened with toxins, nutrients may not get processed and used effectively by the body. The first signs of trouble usually show up in the form of irritated, inflamed skin, and constant rubbing, licking and biting the skin. If not addressed, it can even put the horse at an increased risk for disease, tumors, and even cancer. Detoxing your horse is now more important than ever. 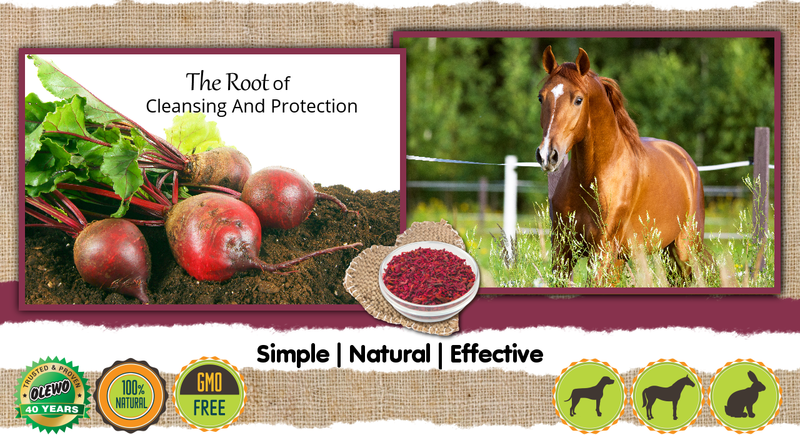 With Olewo Red Beets you can naturally detoxify your horse without harmful drugs or chemicals. The average horse’s diet is high in inflammatory properties from processed feed, high amounts of sugar, and low amounts of nutrients. Adding a dose of nutritious red beetroot to the daily feed is an excellent way to reduce the immune system from triggering ongoing harmful levels of high inflammation. Immune suppressive drugs, or cortecosteroids are often administered by Veterianarians to treat skin problems. While these drugs temporarily reduce inflammation, these approaches do not address the underlying condition that caused the inflammation. 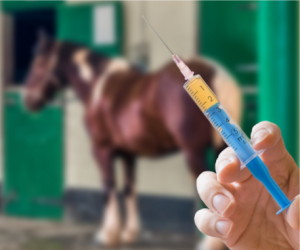 As a result, the horse will have additional flare ups and will need additional treatments with these drugs which add more toxins to the body – it’s a vicious cycle . Olewo Red Beets help boost immunity and can help keep inflammation at bay, naturally. Reduced levels of inflammation help nearly ever system within the horse’s body and fight off diseases including arthritis, colitis, inflammatory bowel disease, dermatitis and pancreatitis. OLEWO Carrots help promote overall health and vitality when used as a daily feed supplement, and help remedy a range of common equine health issues - naturally! OLEWO Red Beets are an excellent natural detoxifier. The betalain pigments in red beets effectively neutralize toxins which are often the cause of allergies. These unwanted toxins get passed out instead of being re-absorbed in the horse's system. Just like humans, horses are exposed to external toxins every day, including pollutants, pesticides and chemicals. Other sources of toxins include medications such as steroids, antibiotics, vaccines and even feed toxins such as chemical preservatives, additives and coloring. Although the horse's body is designed to rid itselft of these toxins, it can become overburdened. Detoxification offers additional support to expel toxins and minimize weight, which is important to maintain health and vitality. OLEWO Red Beets provide a premium source of fiber and help increase the nutrient absorbtion and proper digestion of the feed. Red beets have a gamma-amino acid which plays an important role in maintaining efficient metabolisim. The betaine in red beets helps stimulate the function of liver cells and with a properly functioning liver, fats are broken down efficiently to maintain a healthy weight. While many people tend to lump all food fiber into one category called "Dietary Fiber", there is evidence to suggest that all dietary fiber is not the same. Red beet fiber as well as carrot fiber are two types of food fiber that may provide special health benefits, especially with respect to digestive health (including prevention of colon cancer), as well as cardiovascular health. Concentrated nutrition is needed to meet high-stress and high-energy requirements. OLEWO Red Beets are loaded with valuable nutrients and contain soluable fiber which provides slow release energy, perfect for performance and competition horses. OLEWO Red Beets can help support joint health and can help prevent other ailments caused by inflammation. The product has been tested (on cells, not animals!) 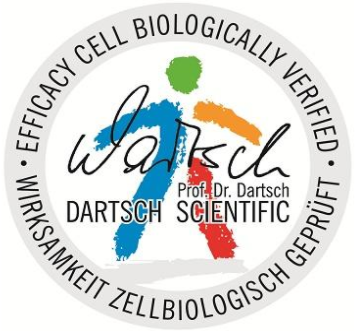 and verified by a Scientific Lab in Germany to document the benefits, one of which was the anti-inflammatory compounds. There are many unique phytonutrients present in red beets, but in particular the anti-inflammatory activity is demonstrated by betanin. The anti-inflammatory compounds, and the antioxidants in red beets that fight off infections, can help with the treatment of eczema in horses. The good sources of vitamin B12, copper, zinc, manganese and selenium in red beets are of significant importance for skin metabolism. Red Beets contain an unusual mix of antioxidants and are unique in the way that they get their red color primarily from betalain antioxidant pigments. Coupled with a good source of antioxidant vitamin C and an excellent source of antioxidant manganese, the unique phytonutrients in red beets provide more powerful antioxidant support than other antioxidant-rich vegetables. The combination of antioxidant and anti-inflammatory compounds in red beets make OLEWO Red Beets the ideal food supplement to help protect against diseases and cancers. Lab studies have shown betanin pigments to lessen tumor cell growth, and researchers are looking more closely than ever at the value of betanins in red beets for the prevention and treatment of certain cancer types. The high iron content in red beets as well as the vitamin B12 and folate can help treat anemia in horses which occurs when the red blood cells are not functioning properly, or simply aren't able to oxygenate their cells. There are different reasons for anemia, but it mostly occurs secondary to some other health issue the horse may be experiencing. Red Beets are one of the richest sources of folate which is an important factor for a successful pregnancy in horses. Dietary folate in early pregnancy has long been recognized to be necessary for normal embryo development. 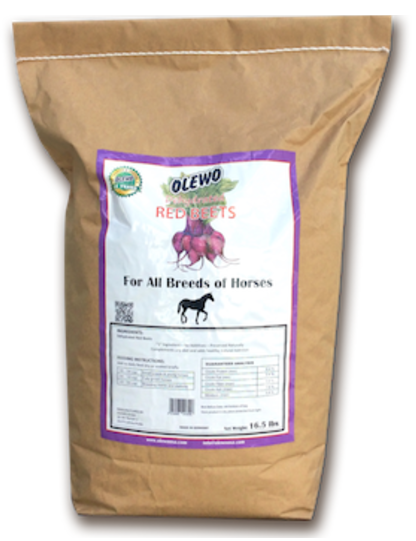 OLEWO Red Beets can help provide the horse's tissues with oxygen and moisture to regenerate and maintain healthy pink mucous membranes. The most commonly examined mucous membranes are the gums. The color of the gums is a good indicator of blood oxygenation. Red Beets are very flavorful and will stimulate the appetite of the most finicky horse!